Abstract: To produce customer-oriented products is the philosophy of Airwheel with the aim to bring joy and fun to every Airwheel rider. Of late, Airwheel has welcomed another member in Airwheel H-series—H8 lightweight power chair which strikes riders as incredible stability and large-capacity storage box. Similar to H3S, Airwheel H8 is also a kind of power chair with dual ride modes. The dual mode of ride offers more choice to the rider. The electric mode (sitting mode) and riders just push the handlebar controller to go. However, long time standing will bring fatigue and the enjoyment drops off. The comfortable seat will make them have a rest and proceeds at the same time. What's more, if you choose to ride your Airwheel H8 seated, you can enjoy an effortless riding experience. The other is the man-powered mode (standing mode) is able to carry more goods and allows people to do exercise. Though it bears much resemblance with H3S, Airwheel H8 power and manual wheelchair still possesses its own defining features. H8 installs a large-capacity storage box under the saddle, which is able to carry the daily necessities, making parents go shopping easier. Its brushless motor using magnetic encoders as sensor is more powerful. Constant engine speed saves battery power and reduces friction, prolonging service life. Outfitted with front 6 inch tires and rear 6.5 inch tires, Airwheel H8 is able to adapt to more road conditions, with brilliant traffic ability. The jumbo tyres enable Airwheel H8 to easily pass many kinds of tough terrains. Moreover, the battery of H8 is removable that provides convenience by allowing the battery charged in the room. To ensure riders' safety, Airwheel H8 installs dual alerts: reverse alert and horn alert. When turning or reversing, it will give you alert if there are obstacles to ensure the safety of rider and others. The senior citizens have the freedom and flexibility to define and pursue our own travelling style. 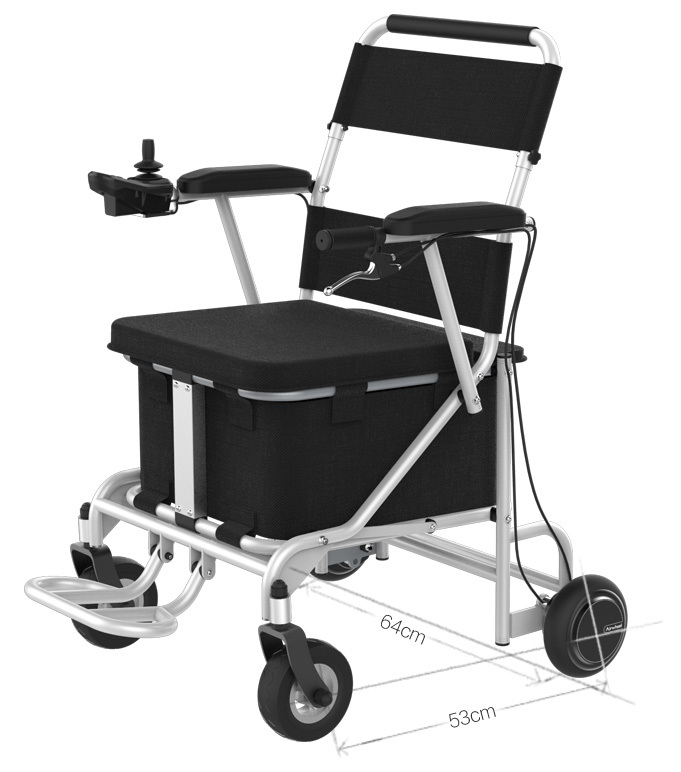 H8 powered mobility wheelchair will be their intimate companies to go to the market, take a walk or go on a tour. Smarts robot is for intelligent living. Previous：Airwheel Smart Electric Scooter: The Best Part about Valentine's Day Is Getting the Presents.